A bag of recalled Golden Flake Tortiyahs. 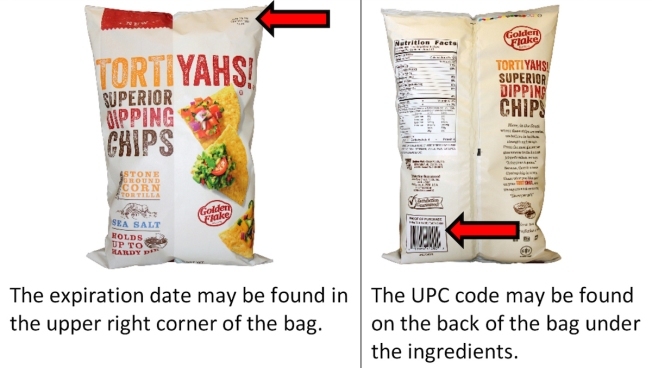 Utz Quality Foods is voluntarily recalling several brands of tortilla chips due to potential contamination of undeclared milk allergen. The Hanover, Pennsylvania-based company announced in a press release that some bags of Golden Flake, Good Health, Utz and Weis brand tortilla chips may have been contaminated with milk, a product that is not listed under the ingredients. People who have an allergy or severe sensitivity to milk run the risk of serious or life-threatening allergic reaction if they consume these products. No illnesses associated with this voluntary recall have been reported to date, and no other products from any of the brands are being recalled. Consumers are urged not to eat the recalled products. Those who purchased the recalled product may return it to the store where it was purchased for a full refund or exchange, or simply discard it. Retailers should check their inventories to confirm that none of the products are available for purchase by consumers and remove all of the recalled products from shelves. For further information please contact the UTZ Customer Care Team at 1-800-367-7629 Monday through Friday 8:30 a.m. to 5 p.m. ET.